It’s summer, and it’s the perfect time to sit outside with your family and friends to enjoy the weather (especially before we are subjected to the Minnesota winter weather again). When it comes to grilling and hanging out in your backyard, there is no better place to do it than your deck. While the basis of decks is pretty simple, they can come in virtually any design, and while there are popular trends that pop up here and there, sometimes you find a few gems that stand out above the rest. As deck builders, we have seen a whole host of deck designs (and built quite a few of them ourselves), each one as unique as the others. 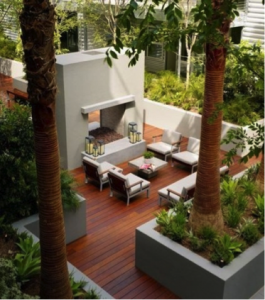 So, if you are looking to have a one-of-a-kind deck that is unique only to your house, use some of these worldly deck designs as a source of inspiration. 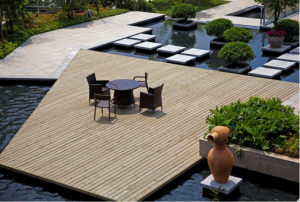 We don’t just mean that you should simply surround your pool with a deck. There are many ways to add a bit of aquatic style to your outdoor retreat. Everything from fountains to hot tubs, waterfalls and more can be incorporated into the design. If you are really adventurous, you can surround your walkways with water to create a little island paradise right outside your back door. If you aren’t into the aquatic look, you could always go the exact opposite elemental direction. Instead of surrounding yourself with water, try making the fireplace the focal point. Fire pits are an awesome reason to spend more time outside, especially at night. S’mores aside, it’s hard to think of anything better than sitting around a blazing flame with some good company. Instead of traveling out into your backyard to build a pit in the dark, you can always make your outdoor fireplace a reality. Since we are sticking with the theme of elements, you could always turn your deck into your own little personal jungle. 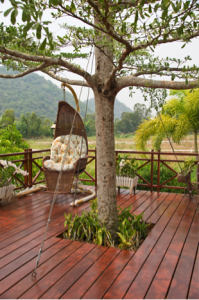 Decks, especially beautiful wooden ones, are very natural on their own, and adding a lot of plants and trees to them can take them a step further. Even if you decide to go the way of vinyl, a few trees and plants can create a nice contrast to your outdoor hangout. No matter how ambitious your dream deck may be, our team at Hoty Exteriors is ready to take on the challenge. Your imagination is the only limit. To get started on building your own personal paradise, give us a call today.